Urge Overkill are back. Did you miss them? Remember Urge Overkill? Well, if you check out the above video of their cover of Neil Diamond's Girl, You'll Be A Woman Soon from Quentin Tarantino's classic Pulp Fiction, you'll probably go, "Oh, yeah! 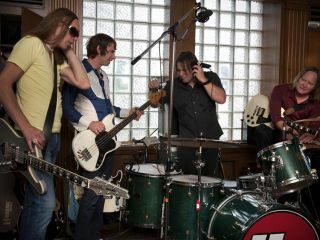 Urge Overkill...Whatever happened to them?" Well, they're back. Fifteen years after their last album, the band has reformed - the new lineup consists of original singer/guitarists Nash Kato and Eddie 'King' Roeser, along with drummer Brian 'Bon' Quast and bassist Mike 'Hadji Hogkiss.' They are currently writing and recording new music in their hometown of Chicago, and will be performing at the Samuel L Jackson-hosted Friar's Club Roast of Quentin Tarantino on 1 October. While the new album isn't due until 2011, they do have a taste of some fresh music to sample, however. Click here to listen a track called Effigy. What do you think? Time for a comeback? After all, the '90s revival is just around the corner.Or is it already here?